Blurb Description: As bubbly as champagne and delectable as wedding cake, Once and for All, is set in the world of wedding planning, where crises are routine. Louna spends her summers helping brides plan their perfect day and handling every kind of crises: missing brides, scene-stealing bridesmaids and controlling grooms. Not surprising then, that she's deeply cynical about happy-ever-afters, especially since her own first love ended in tragedy. When handsome girl magnet Ambrose enters her life, Louna won't take him seriously. But Ambrose hates not getting what he wants and Louna is the girl he's been waiting for. Maybe it's not too late for a happy ending after all? I read my first Sarah Dessen book when I was twelve years old. A friend gifted me Along for the Ride for my birthday and the very next morning I was halfway into it. From twelve to almost nineteen, Sarah Dessen’s books are ones I’ve cried over and laughed and fallen in love with as I got to know, time and again, Auden, Eli, Remy, Dexter, Annabel, Owen, Macy, Wes, Ruby and all these other couples that taught me so much. 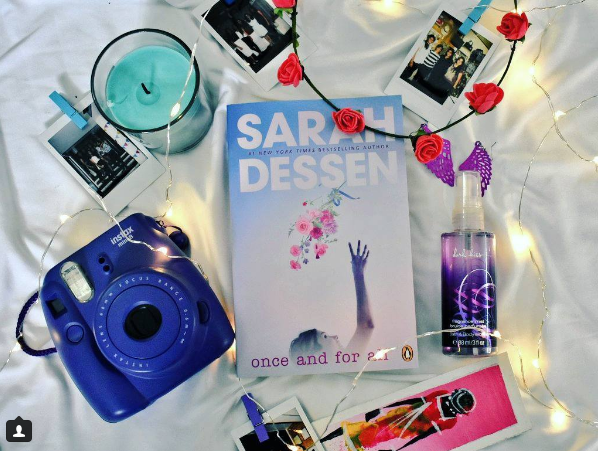 I remember myself over the last seven years through Sarah Dessen’s book, and it’s truly a magical feeling. Which is why, among the BOX FULL OF BOOKS that Penguin India sent me last week, the one I was most excited for was Once and for All. To Sum It Up: Once and for All was the heart wrenching journey of a girl brought up by cynics who are waiting to be proven wrong and trying to figure out if putting your heart out there is worth the risk while managing chaotic weddings and bad first dates. Long Story Short: I LOVED IT. This was definitely one of my top five Sarah Dessen books! Sarah has this distinctive, subtle form of writing that I’ve loved since book one that all of a sudden throws these beautiful and true lines at you. I’ve loved this BRILLIANT author’s BRILLIANT writing since I was 12 and I don’t think it’ll ever change. 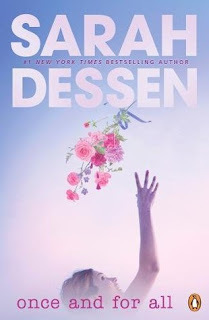 The one thing I love about Dessen’s books is that NONE of them are JUST Boy Meets Girl. There is always more to the story that just one romance, often involving a heart breaking personal journey from the girl’s side and it’s ALWAYS SO REAL. It makes me connect with all of her characters in a way I usually don’t and I love it. I loved Louna from chapter one. I’m probably like her, a cynic until proven otherwise, scared to let what I’m feeling show. I loved her narration, her story and her fears. I felt, by the first quarter of this book, like I really knew this girl. I also ADORED Jilly, Louna’s best friend, and her whole family. I feel like she deserves her own book. Her story with Ethan broke my heart. It was this romance that just doesn’t happen anymore and BUT IT DID and it was so perfect while not being unreal and GOSH I ALMOST CRIED. My one problem with this book was the romance between Ambrose and Louna. I LOVED THEM AS FRIENDS and also as people but their romance and the “love” between them seemed SO FORCED. This book is about Louna moving on from a broken heart and finding a way to give it to someone else AND it’s set with a wedding planning business in the background which gives off its own form of hilarity. I LOVED THIS BOOK YOU GUYS. It will make you laugh and cry and fall in love like only Sarah Dessen can. 4 stars. 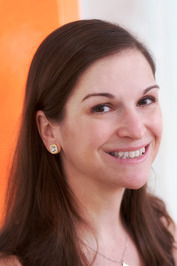 Sarah Dessen is the #1 New York Times bestselling author of over a dozen novels for teens, which have received numerous awards and rave reviews. Her books have been published in over thirty countries and have sold millions of copies worldwide. She is the recipient of the 2017 Margaret A. Edwards Award from the American Library Association for outstanding contribution to young adult literature for her novels: Keeping the Moon, Dreamland, This Lullaby, The Truth about Forever, Just Listen, Along for the Ride, and What Happened to Goodbye. Her newest novel, Once and for All, will be released in June 2017. An NC native, she currently lives in Chapel Hill with her family. 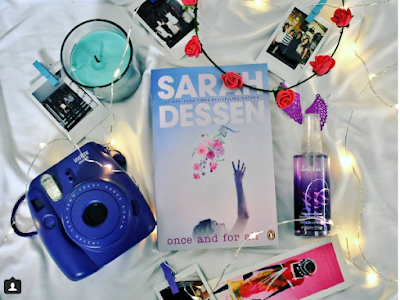 Have you read any Sarah Dessen books? Which was the first one you read? Which protagonist do you most relate with and which one is your favourite? I can't wait to hear your Sarah Dessen thoughts.